She Was a Beacon of Justice During the Dark Days of World War II. She Continues Her Heroic Battle Against Evil Today. Then and Now, Liberty Girl’s Fight has always been the same-A FIGHT FOR FREEDOM! Pro Se Productions Proudly presents the second book based on Heroic Publishing’s LIBERTY GIRL, available in print and digital formats. With tales by Richard C. White, Lou Mougin, and Lisa M. Collins and based on concepts created by Dennis Mallonee, LIBERTY GIRL: FIGHT FOR FREEDOM takes readers to the core of this stunning Heroine, revealing what makes her tick, why she wars against Injustice, and how, no matter how powerful a force challenges her, she will never surrender freedom, hers or anyone else’s. Known for the Finest Superheroines in Comics, Heroic Publishing has teamed up with Pro Se Productions to bring its colossal cast of characters to prose! Two Independent Publishers Join Forces to bring a Superheroine to life in a brand new way. Heroic Publishing and Pro Se Productions Proudly Present LIBERTY GIRL: FIGHT FOR FREEDOM! 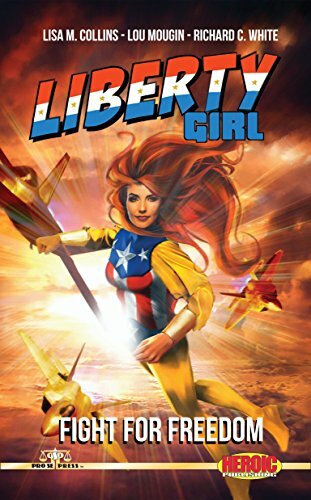 Featuring an inspiring cover by Jeffrey Hayes and cover design and print formatting by Antonino Lo Iacono and Marzia Marina, LIBERTY GIRL: FIGHT FOR FREEDOM is available now at Amazon at https://www.amazon.com/dp/1974038661/ref=sr_1_1?ie=UTF8&qid=1502073295&sr=8-1&keywords=liberty+girl+fight+for+freedom and Pro Se’s own store at www.prose-press.com for 10.00. This Pro Se/Heroic anthology is also available as an Ebook, designed and formatted by Lo Iacono and Marina for only $2.99 for the Kindle at https://www.amazon.com/Liberty-Girl-Lisa-M-Collins-ebook/dp/B074LY6LMZ/ref=sr_1_2?ie=UTF8&qid=1502114674&sr=8-2&keywords=liberty+girl+fight+for+freedom. LIBERTY GIRL: FIGHT FOR FREEDOM is also available on Kindle Unlimited for free to Kindle Unlimited members.